As a born and bred Brightonian, one of the most interesting things to observe over the years has been the changing perceptions of various areas as time goes by. When I was a girl any mention of London Road was accompanied with a sneer or a narrowing of the eyes. It always seemed a bit unfriendly, a bit grey and lacking the sparkly excitement of other parts of Brighton. Fast-forward a few more years than I care to remember and not only does London Road generate smiles rather than scowls, but it now also boasts some genuinely fantastic places to eat and drink. A perfect example of London Road’s changing face is The New Unity. Previously the rather intimidating Branch Tavern, it has undergone major works and could not look more different. Gorgeous woods dominate and the majority of the main bar is filled with four-seater wooden tables, beautiful high leather seats and your own TV screen. Yes, you’ve read that right. On our visit, the lovely bartender ‘T’ explained they have the ability to show five different channels simultaneously, meaning gone are the days of arguing with your mates about where is more likely to show some obscure footie match. The New Unity is bound to have it covered and what’s more – there’s food and drink too. 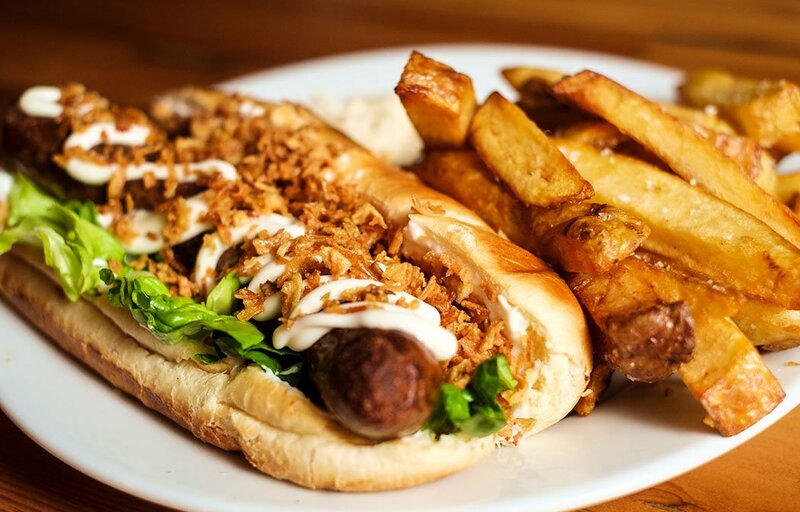 The food menu is a tempting mix of bar snacks, build your own hotdogs, burgers and sharing platters. We started with three of the bar snacks to share: Crispy Hoisin Pork Balls with Spiced Apple Chutney (£6), Slow-Cooked Pork Ribs with BBQ Sauce (£5) and Beer Battered Cod Goujons with Tartare Sauce (£6). We also got a £3 discount for ordering three snacks which was a nice bonus! I was slightly nervous about the hoisin pork with apple but the chutney was wonderfully warm and subtle and complemented the juicy and plentiful pork wonderfully. The cod goujons were really top notch too – flaky, high quality cod encased in crunchy batter with a punchy tartare sauce. However the star of the show, and probably ranking with some of the best I’ve ever had, were the ribs. They were so skilfully cooked that the meat actually slid from the bone and at times I thought there was a good chance the table would get into some sort of fight in determining who got to eat the last ones. Being a gluttonous group we weren’t finished there. We built a couple of hotdogs – a Beef, Mustard and Horseradish Sausage (£8), American Mustard (free) and Fried Onions (£1) and a Roasted Pepper, Garlic and Tomato Sausage (£8), Garlic Mayo (free) and Bacon (£1). Both hotdogs came with a huge portion of chunky chips, and some coleslaw. Knowing that the fantastic Brighton Sausage Company supplied all the jumbo sausages meant I knew we were in for a treat and I wasn’t disappointed. The beef sausage was rich, meaty and moreish and our experimental mix of vegetarian sausage with added bacon was actually really tasty. The brioche buns were particularly good quality, and held their shape really well – after all, there’s nothing worse than a bun that falls to pieces! The huge chips were a marvel too: crispy on the outside, fluffy on the inside and went down very well with the creamy coleslaw. I washed my meal down with a very respectable large glass of Malbec (£7.40) – not bad at all. The New Unity really impressed me. 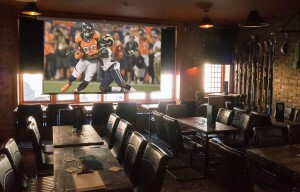 I can’t think of a better place in Brighton to watch sport, drink good drinks and eat some fantastic food with friends. The New Unity is at 52-53 London Road, Brighton.